Looks like Cutch beat me to it! Here's my first attempt at a new outing. It's the Breitenbush River. A small Oregon river in the Cascade Mountains that empties into Detroit Lake (which dumps into the North Fork of the Santiam River - my next project). The river contains Native Rainbows, Kokanee (landlocked sockeye salmon - to be added later) and landlocked Chinook Salmon. The Kokanee and Chinook run up the river in late September - Early October to spawn. They normally won't hit flies, unless it's something that bumps them on the nose and makes them mad! In place of Chinook, I've used the Atlantic Salmon from the game, and reduced their size accordingly. Sorry, there won't be any monsters in here. Paul has put a fish editor on his to-do list so that I can colorize some salmon the match the red body, green head of the kokanee in the spawning phase. I hope you all enjoy the Breitenbush as much as I do. Caution - it's a big download - 45 MB - there are 13 outings, one only available in challenge mode. If you find any major errors, please let me know. Last edited by dcarp on Tue Nov 13, 2007 3:26 am, edited 1 time in total. What a wonderful job you did with the photography Makes me want to come up and fish your stream. I fished every site, catching one fish each one. I wanted to hurry and see all the sights. (sites) I like the sound waves you installed too. Congrat's on a job well done. I'm getting the same message as fishin musician I have not down loaded the river making kit could this be the probelm. On the first page it has a link to download version 115. I think this is the problem, but wait until Paul, or someone smarter than me will have to verify this. Wow, it's a beautiful outing. Very nice photos. Great work, Dave. great outing, it fished well, at the moment i only noticed no code for the fish that are caught and no code for the outing fished. maybe Paul will help with that. Pleae ignore my previous post as i forgot i was in cheater mode, i have completed in normal mode and got a code for every fish and a code for the outing. I've got to echo everyone and say Dcarp did a great job on this river! This was the first time I got to fish a river in the game that I hadn't integrated, so exploring each fishing site was a lot of fun. Finally I get to see what it feels like to explore unfamiliar water in RWFF! Well done! I'll see what I can do about editing ones own posts. It's probably a setting I can toggle on. 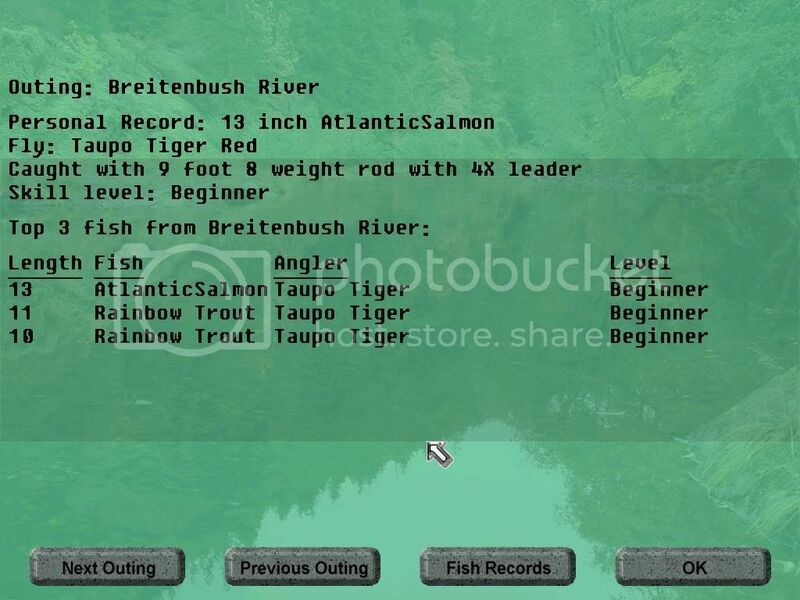 Version 115 (which isn't on the downloads page yet, only on the OCK page so far) is needed to fish in custom outings. The issue with fish codes is significant, too. I'd considered disabling fish codes for custom outings because anyone could edit the configuration files making the fish bigger and hungrier to cheat in a contest. But that won't be necessary. I'll make some changes to let outing developers lock them down (if they want to) so others can't edit or view the configurations. As for records files, that's a step I should add to the instructions for preparing an outing for release. All the .rec files should be removed, including personal and top10 files. I'll get that added to the documentation. 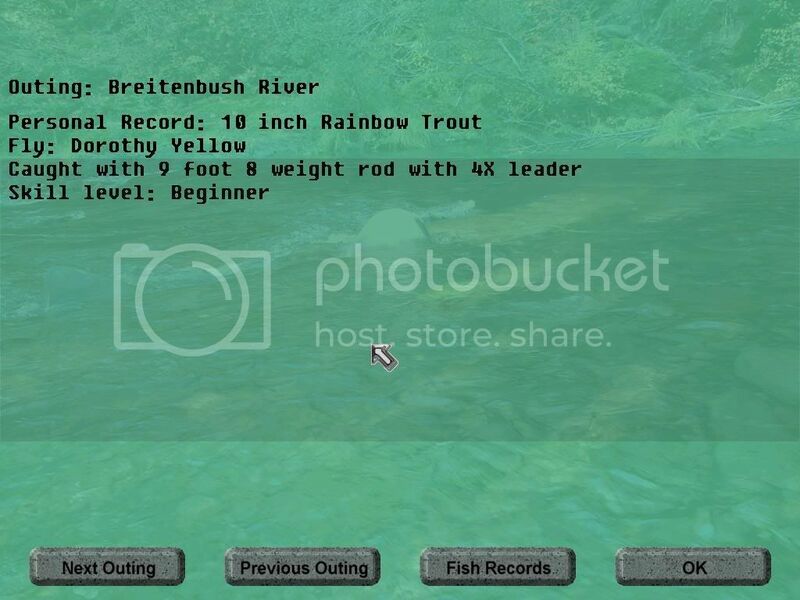 I did what cutch suggested last night and got the new river going a big thank you to Dave this is a great additional river to be exproling I hads a lot of fun catching a few 10 to 14 inch trout havedn't caught a salmon yet. Next fall Manily in October I might try shooting at Oneil forbay and if I get lucky I should get some nice striped bass during the fall they are really going after top water baits and it is alot of fun there are usually alot of other fisherman and I sure I could get some pictures for the game. That would be really kewl if you could get a bunch of different sized pictures of Stripers so Paul could add to the game. We have stripers in several rivers along our Southern Oregon coast.